Sometimes you come across a restaurant or cafe that is so charming and lovely that you literally don't want to tell anyone else. News of its existence circulates via word of mouth (and through clenched teeth) as no one really wants it to get too popular. If you tell someone, it means that your chances of securing a seat have declined, so it's really in your own best interests to stay quiet. Shhssshhh then, don't repeat what I'm about to tell to you to anyone else. It's just between you and me, right? Bibi's Cafe on Emorville Avenue is a teeny-tiny cafe attached to sister enterprise, the Doll's Boutique. (Perfect for those folk who would like to combine some cool clothes shopping with coffee and tasty cake). Doll's is run by Petria Lenihan, while sister Maisha Lenihan looks after the culinary action in Bibi's (which is named after their grandmother, Bibi). Sitting at the outdoor tables in the sunshine on a street of residential redbrick houses is hard to beat, but you can head indoors in inclement weather. Inside, there are a few small tables along a banquet seat with additional stools providing seating at a tall counter (but in order to sit there, you'd have to elbow aside all the fabulous looking cakes). 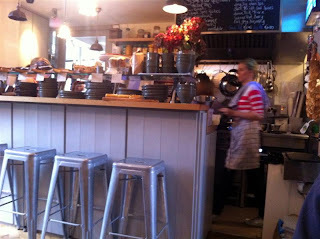 A proper multi-ring gas cooker lurks behind the counter, providing the beating heart of Bibi's. We visited recently for Saturday brunch and were given a hand-written photocopied menu. It's not too often you read a menu where you could happily choose any dish, but this was one such case. We dithered between delicious sounding dishes such as Eggs Florentine, brioche French toast, spciy beans on toast with chorizo before making our choices. We both initially had our eyes on Bibi's version of a toastie - a pan toasted sandwich with ham, Gubbeen cheese and homemade chutney (€7.50). Made from thick toasted slice of bread, golden brown on the outside and with cheese oozing down the sides, it was simply the best toastie ever! (Disclaimer - may contain slight exaggeration). Granted, the homemade chutney could have been spread a little more evenly, but the generous melted cheese content won my heart. 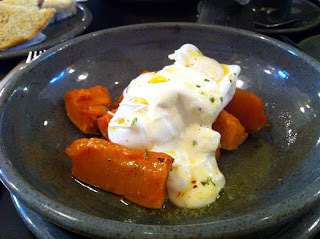 The inclusion of roasted butternut squash in a breakfast dish intrigued me. It came served in hearty chunks with two poached eggs, garlic yogurt and a coriander & chili butter (€9.50). The squash was cooked beautifully and worked really well when dunked in the punchy garlic yogurt and punctured egg yolk. The only slightly disappointing aspect was the chili & coriander butter which could have been stronger - after all, the butternut squash can take heat really well. 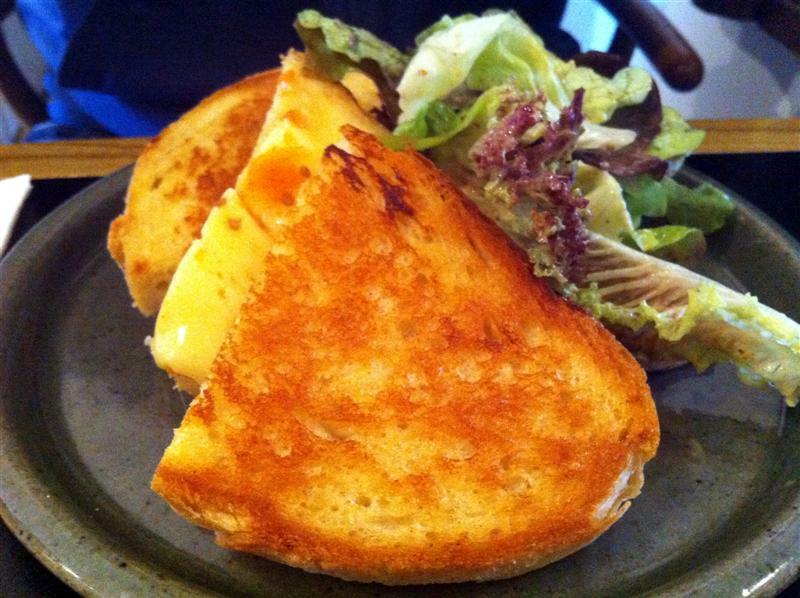 The dish was served with 2 toasted slices of the same crunchy bread as used in the toastie. We were enjoying brunch as Bibi's so much that we lingered for a second cup of good coffee, which comes with mini portions of their tasty cakes nestled in the curves of the spoons. On the day we visited, it was a scrummy tangy lemon cake. Americano coffees were €2.50 while lattes were €3.00, and takeaway coffee is available if you're in the neighbourhood. So there you have it. Grudgingly, I've shared the word on Bibi's. I really shouldn't have though, as I want to keep it all for myself. So don't go there, alright? And let me remind you one more time - don't tell anyone else. I know what you mean when you say 'shhh' I do that all the time. I find a place, I love it, I go there - alone. Then, I slip up, tell one person about it and the whole world piles in and I can't get a table and they have run out of the specials. I love places like this Joanne. Sounds like they have a decent amount of inventiveness going on and the price is right. Good coffee is very important in my book too. Update August 2014 - came back to Bibi's for lunch today, and it's still just as good. The Doll's boutique is gone now to make room for more tables from the cafe. So it's marginally easier to get a table now!